Captain America: The Winter Soldier starts hot but ends cold. This sequel begins with an uncommon sense of freshness. The opening action sequence, involving Algerian pirates commandeering a SHIELD vessel, is crisp and vivid as Captain America darts around the ship knocking pirates into the sea while honing in on his hostage rescue mission. 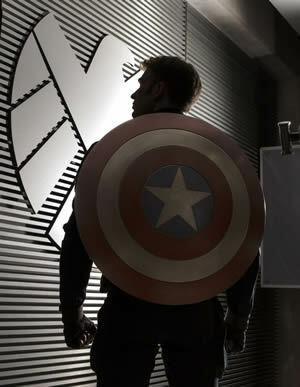 Cap’s shield ricochets off walls and bad guys with aplomb and the fights are well staged. Then the rest of the movie happens and what follows feels an awful lot like a Marvel version of The Dark Knight Rises. As the story grows more and more familiar, The Winter Soldier turns into a burdensome affair that flashes bits of Joss Whedon-inspired humor even as several characters die — or almost die or seem to die or any other variation on that riff - in what amounts to numerous attempts to play on the heart strings. Mimicking the Dark Knight trilogy, there’s also a theme of freedom versus fear and a plot line involving the nefarious group called Hydra (think League of Shadows in the DC universe) plotting to annihilate 20 million people in order to bring the other 7 billion into submission. There’s no point in belaboring the stale story elements, but how ‘bout one more? The climactic conflict is a variation on the ol’ Death Star battle formula, with the good guys having to swap out three computer chips in massive flying battle ships in order to thwart the triangulation of communications that will in turn yield the vaporization of millions of oysters... Er, make that millions of voices. It’s not all bad. In fact, what is good about The Winter Soldier is really good. The first half hour or so provides plenty of reason to expect great things from this product of the Marvel/Disney machine works. But the good parts aren’t quite enough to overcome the obvious and numerous weaknesses. It’s kinda interesting Captain America, also known as Steve Rogers, questions what he wants to do with his life. He’s still adjusting to that time zone change of several decades from his World War II adventures and modern times leave him a little uncertain about humanity’s security. The brutal steps taken to defeat the Nazis have been warped into a scare tactic intended to hem in freedom instead of liberate it. In any case, Steve’s too busy to date anybody, despite Black Widow’s attempts to suggest suitable candidates for romantic adventures. The first time she does it — right before Captain America skydives out of a plane without a parachute — is pretty funny. But the joke is pulled again later, after a big ol’ fight with the bad guys, and it feels incredibly forced. The directors, brothers Anthony and Joe Russo, are perhaps best known for TV work including Arrested Development and Community. Maybe that’s why a large swath of The Winter Soldier plays more like an episode of Agents of SHIELD than a big screen epic. They’ve assembled a terrific cast that includes some Marvel franchise regulars along with some new faces to the Marvel universe. Scarlett Johansson (Black Widow), Anthony Mackie (Falcon), Samuel L. Jackson (Nick Fury) and yes, Chris Evans (Captain America) all lend the material more credibility than it truly deserves. And then throw the legendary Robert Redford into the mix and the end result should be much more involving, compelling, exciting — any number of things that would warrant a cast of such deep-running talent. Instead, this one feels more like a fan-centric installment as SHIELD is dissolved following infiltration by Hydra, a story of such impact on the larger Marvel storyline it should’ve included more of the Avengers (familiar characters like Iron Man, Hulk and Thor). By the end, lead characters are being sent off in new directions intended to generate buzz about what might lie ahead. No doubt adding geek appeal is the return of Garry Shandling, who reprises his Iron Man 2 role of Senator Stern, a goofy, corrupt politician. There’s even a reference to Dr. Strange and, of course, there are also the now standard couple of teases during the end credits. That’s all fine and dandy, but counter that with the titular nemesis, the Winter Soldier. Much like Captain America, he’s also a science experiment from those WWII days. The Winter Soldier is an assassin who’s shaped world history for 50 years. That’s a powerful idea. But he’s also got an identity crisis, a situation which makes for some choppy storytelling. And given his borderline mute level of communications, he doesn’t exactly bring the drama.